I've shared my favorite beauty products & I've shared my favorite skincare products and today I'm finishing up this series by sharing my favorite hair products! SHAMPOO/CONDITIONER - Joico Blonde Life. I recently got sent these products & I loved them after my first use! My hair looked & felt so soft! I recommend using the entire line: shampoo, conditioner & masque for the ultimate results. DRY SHAMPOO - Klorane Dry Shampoo. I have tried what feels like every dry shampoo under the sun. So many of them left my hair feeling sticky or left a white residue in my hair, but this one doesn't do any of that. A few little spritzes goes a long way & leaves my hair looking fresh & voluminous. CURLING WAND - HOT TOOLS. I have this wand in both the tapered and 1 inch & love them both. When my hair was shorter, the tapered wand was perfect for getting effortless waves & now that my hair has gotten longer, the 1 inch wand gives me those loose beach waves as well. I love that these heat up fast & work quickly! HAIR MASK - It's a 10 Hair Mask. I color my hair & use heat on at least a couple times each week, so my hair gets fried on the ends. When I'm at the salon, I treat myself to a Fusio Dose treatment, but when I'm home in the shower, I try to treat my hair to a mask once a week. This one leaves my hair super soft, shiny & smooth. PURPLE SHAMPOO - Matrix So Silver. I have been dying my hair blonde for over 5 years now, but it's always been more of a golden tone. Recently, I wanted to switch it up and try a more ashy blonde. In order to keep my hair more of a 'white blonde' than a 'yellow blonde,' I have been using purple shampoo once a week! I'll admit I was very intimidated by the dark purple shade that came out of the bottle, but this stuff really works! SALT SPRAY - Bumble & Bumble Surf Spray. Been using this spray for years & it never fails to give me the perfect beach hair. I spray this product on freshly styled hair to give it some grit & on day old styles to add some extra volume. DRUGSTORE SHAMPOO/CONDITIONER - Garnier Whole Blends. I was sent Garnier Whole Blends samples about a year ago to try out & I have been hooked ever since. I love the various shampoo & conditioner formulas & how well they work on my hair! My favorite is probably the hydrating formula but they have formulas for all hair types: repairing, smoothing, refreshing, etc! HAIR BRUSH - Wet Brush. A wet brush is a must have for detangling your hair after a shower & not totally damaging it! I love that the bristles are extra flexible so it can get the knots out of my hair without any pain or breakage! HAIR SPRAY - Garnier Volume Hairspray. In case you haven't noticed a trend yet, a big worry of mine when it comes to hair is volume. My hair is thin & often falls flat so I love products that help amp up the volume & this product totally does. It's not overly sticky & lasts all day too. Did I miss out on anything? Is there a product you love that I have to try? Let me know what it is in the comments below! 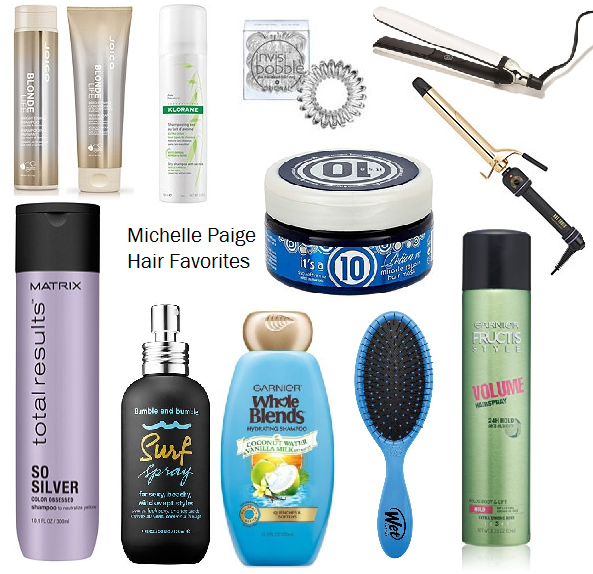 I am always looking for new hair products! Thanks for sharing your faves, i'll definitely have to try out those hair ties! I love salt sprays, perfect beach hair every time! This looks like a great list, I'll definitely have to give some of these a try. Absolutely! The Bumble & Bumble brand is the best!